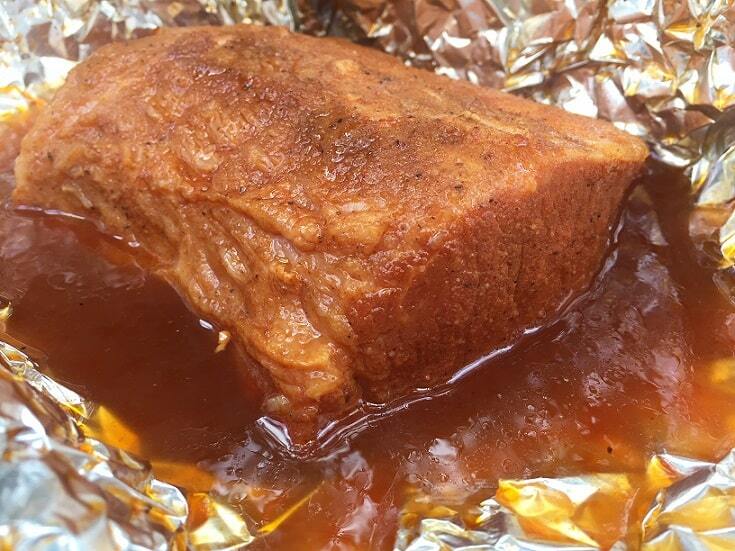 Pork loins are big tubes of lean meat that have confounded many pit masters! 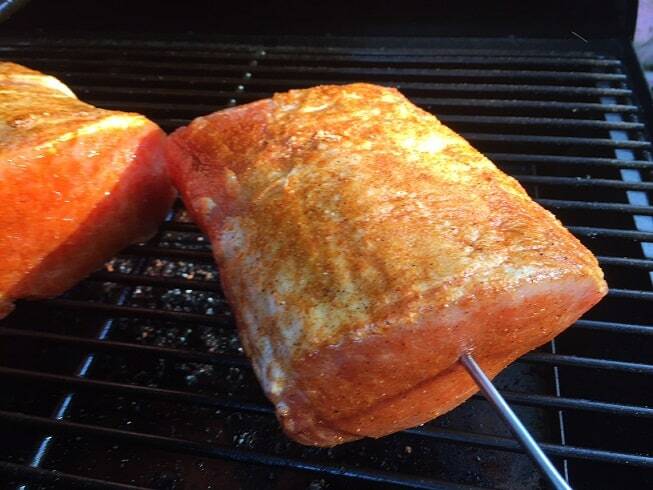 When you smoke a pork loin correctly it can be tender and juicy. Mess it up and you are dealing with shoe leather. The trick is you have to figure out if you want to your loin to be sliced or pulled. The answer to that question will tell you how long to smoke the pork loin. Here is the deal…there are two target temperatures to have in mind when you are cooking a loin on your pit. The loin will be done and juiciest when it hits an internal temperature of 145F. 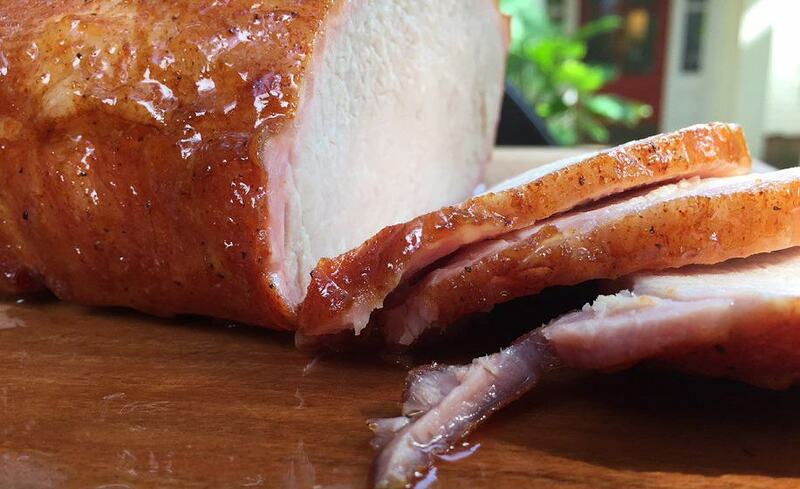 A loin cooked to 145F can be sliced thin and piled high for a serious platter of great eating. The loin will start to fall apart and become “shredable” when it hits an internal temperature of 205F. Again, you will get a serious pile of good eats. If you pull the loin off the pit anywhere between about 150F to 195F it is going to be a tough piece of meat that is trapped in limbo between the two target zones. 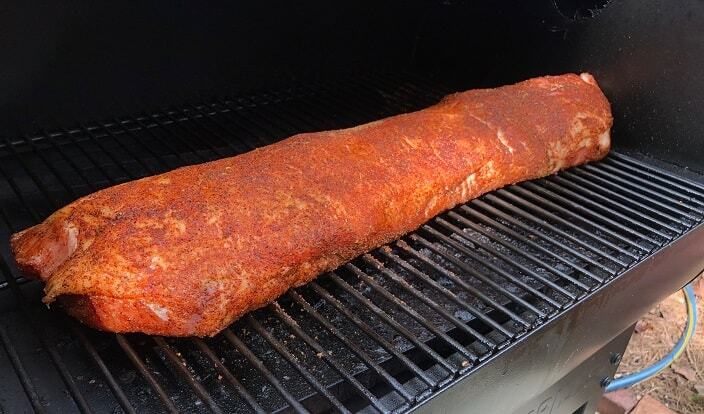 So, the answer to the question of how long does it take to smoke a pork loin is…it depends on what you want. I did the experiments to get you some approximate cook times. 225F: Slicing Stage in 2 Hours, Pulled Stage in 5 Hours. 275F: Slicing Stage in 1 Hour, 40 Minutes, Pulled Stage in 3 Hours, 40 Minutes. 325F: Slicing Stage in 1 Hour, 30 Minutes, Pulled Stage in 2 Hours, 40 Minutes. Here is what the cooks looked like. I started with a 9 pound loin, seasoned it with my favorite pork rub and smoked it with hickory at 225F. I really don’t recommend cooking an entire loin in one piece as the size is incredibly awkward. The meat was cold when it went on the pit and started at with an internal temperature of 41F. The loin reached the slicing temperature of 145F in two hours. 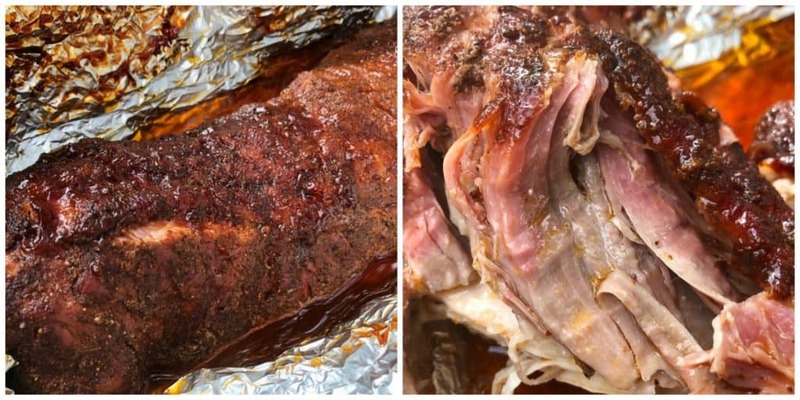 I wanted to cook this loin for pulled pork so once it reached 145F I wrapped it in two layers of aluminum foil with some barbecue sauce and put it back on the pit at 225F. It took another three hours for the loin to reach an internal temperature of 202F for a total cook time of five hours. Be VERY careful when you take something like this off of your pit. The foil is hot, filled with scalding juices and is awkward to handle due to the size. This loin shredded easily and made some great sandwiches after getting tossed with some sauce. For the remainder of these cooks I made life easier for myself. I started with a 10 pound loin and cut it into four sections of approximately 2.5 pounds each. This makes the meat easier to handle but shouldn’t impact cook times too much as they all had the same cylindrical shape. Before each cook the loins rested at room temperature for about 30 minutes while my pellet grill came up to the target temperature. I put two 2.5 pound loin sections onto the pit and inserted the temperature probe from my Maverick digital thermometer into one of them. It took an hour and 40 minutes for the pork loin smoked at 275F to reach an internal temperature of 145F. This is the perfect temperature for sliced pork loin. The loin was glazed with some peach preserves and tasted as great as it looked. When I took the slicing loin off I tightly wrapped the other loin in foil with a half cup of apple juice and bbq sauce (4:1). I wanted to make sure that it didn’t lose any moisture as it cooked up to the pulling stage. It took the foiled loin another hour and forty minutes to reach the pulling temperature of 205F. This ended up with a smoking time of an hour and 40 minutes in the smoke and an hour and forty minutes in the foil for a total cook time of three hours and twenty minutes. I raised the temperature of the smoker up to 325F and repeated the experiment. Cooking the loin at 325F got the loin to the optimum slicing temperature of 145F in one hour and thirty minutes. The second loin was tightly wrapped as before and took another hour and ten minutes to reach 205F for a total cook time of two hours and forty minutes. I really want to emphasize the importance of tightly foiling the loin with some liquid if you want to take it to pulling temps. The loin is going to release a lot of juice as it climbs to higher temps and you want to be able to collect them to mix back into the pulled pork. These cook times should be a good approximation to get you started whether you are cooking on an electric smoker, pellet grill or offset smoker. Make sure you use a good digital thermometer to get accurate internal temperatures. Although I was smoking 2.5 pound loin sections the time should not change much with larger pieces. Larger loins are simply longer and not thicker so they should not vary significantly in cook times. I wanted to share a few recipes and tips to help you nail your cook. Loins can be pretty bland so it helps to have a flavorful dry rub. Here is a recipe that I like a lot. 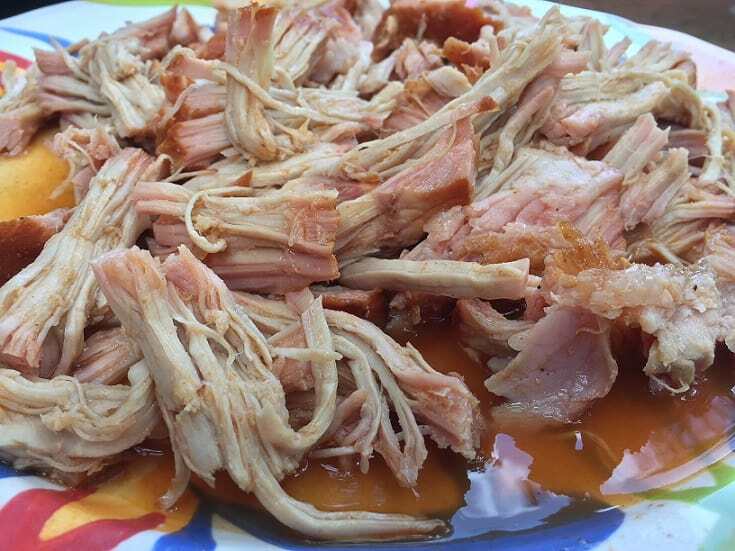 I toss the pork with this sauce after it as been shredded. This is enough sauce for about four pounds of pulled pork. You can dial back on the red pepper flakes or omit entirely depending upon how your crew feels about heat. Should You Inject, Marinade or Brine? I wouldn’t bother using a marinade since those only penetrate the outer quarter inch of the meat. 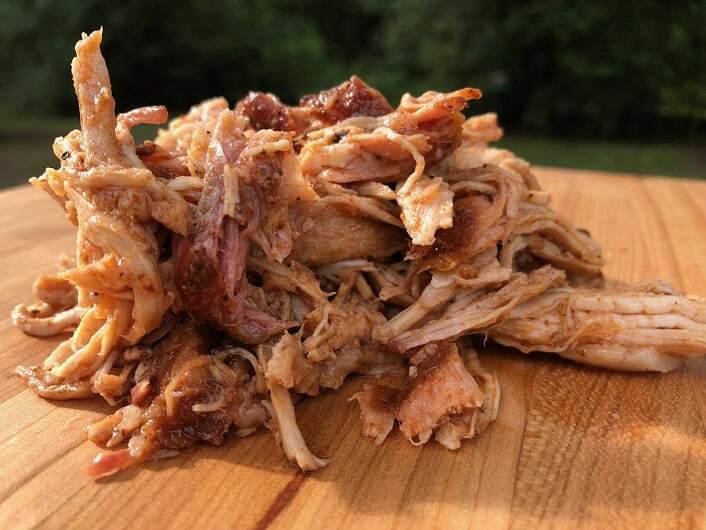 If I am going to be making pulled pork then I don’t bother injecting or brining since the meat will be tender and flavors will be added with the finishing sauce. If I am going to be making sliced pork then I will take the time to brine or inject. 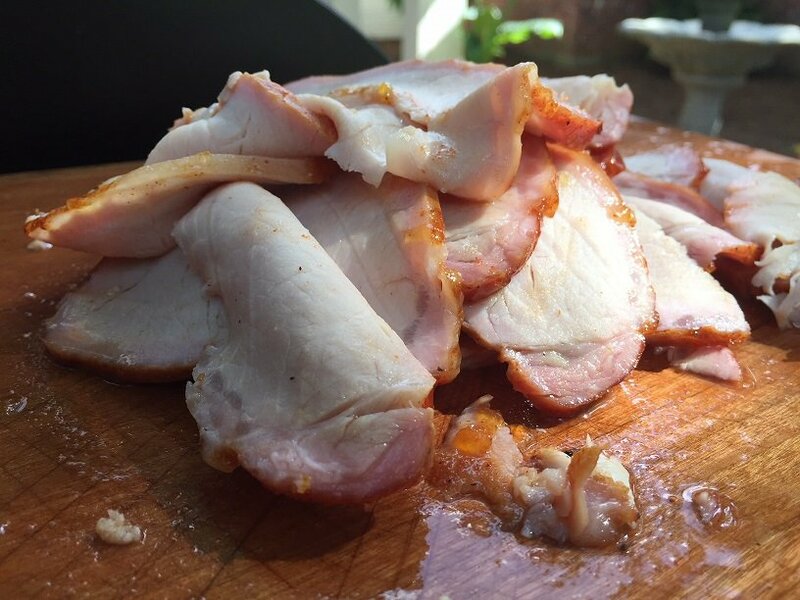 I tend to prefer brining overnight instead of injecting as I think you get better overall penetration instead of concentrated, streaky flavor pockets. What is the Best Temperature for Smoking Loins? People can argue about this all day long but I prefer smoking loins at 225F. I think the lower temperatures helps the meat stay tender. This is also the temperature that I use to smoke baby back ribs so I can cook loins and ribs at the same time. The downside of smoking at 225F is that it takes a long time. If you are planning on making pulled pork and are in a hurry then you aren’t going to loose much quality by bumping up the heat. excellent. Thank you. Smoker season is upon us. I grabbed a loin and I was unsure of temp. I bought a nice treager last year. Enjoy the Traeger! Smoke on!